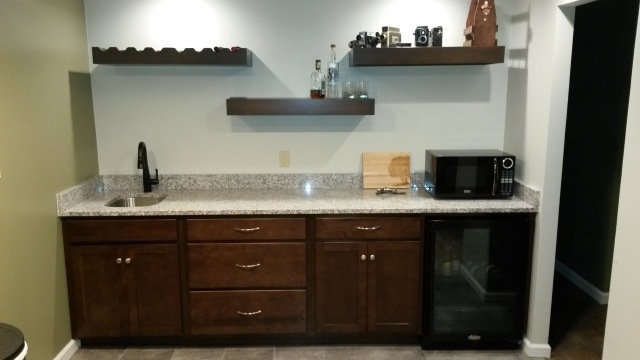 New Basement Bar | A.B.E. Remodeling, INC. This basement has a new look.... and an invitation to have a "night"cap. 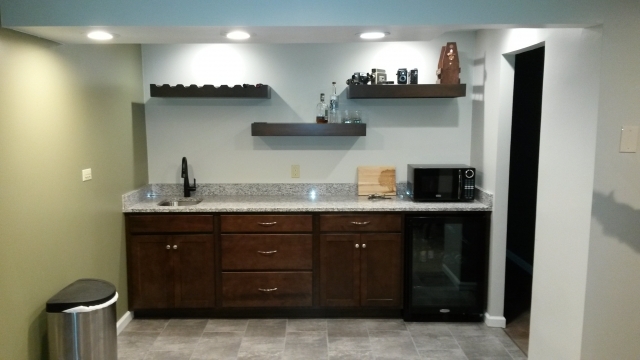 The homeowners turned this section of their basement to a useful space for themselves and friends. They added a bar area. Although we can't tell you the wines they have stocked we can tell you that the homeowners were excited to have this new little area to their enjoyment. How about you??? thirsty? perhaps you may find a space in your home where you want to consider a bar of your own. Or maybe you just need to find a space to put a little "he" shed or "she" shed inside the house. Just a space to call your own. Call us with your ideas. See all the PICS Here!